Designed in collaboration with the chefs at Kohler's Five Diamond resort hotel, Stages meets the needs of the serious home cook. The Stages sink comes with a full array of integrated accessories to simplify the cooking and cleanup processes. The design offers a wide basin to accommodate large pots and pans, as well as a stepped side platform for prepping food or drying dishes. Handcrafted from premium quality, 16-gauge stainless steel, Stages features an engineered sound-absorption system that significantly reduces disposal and dishwashing noise. Single compartment with wet surface work area. Includes wood cutting board, bowls, and serving tray/cutting board. Includes utensil tray/cutting board, sink rack, and accessory rack. This Undertone sink offers a gracefully curved shape that mimics the natural arm span movement, allowing you to perform kitchen tasks with ease. Constructed from premium stainless steel, the extra-spacious D-shaped bowl provides ample room for soaking pots and pans. A mirror-finish edge adds an elegant accent. An engineered sound-absorption system significantly reduces disposal and dishwashing noise, as well as condensation underneath the sink in high-humidity environments. Handcrafted from stainless steel, Vault brings bold new style to the traditional farmhouse sink. Tightly angled corners maximize basin space, and a lowered divider offers freedom of movement between basins. An included bottom sink rack fits the large bowl and helps prevent scratches. Due to its shortened apron, this sink does not require a special apron-front cabinet, making it easy to install with most new or existing 36-inch cabinetry. The Self-Trimming(R) design requires only a simple rough cut, overlapping the cabinet face for beautiful results. Stages Undercounter Stainless Steel 33X18.5X9.8125 0-Hole Single Bowl Kitchen Sink Designed in collaboration with the chefs at Kohler's Five Diamond resort hotel, Stages meets the needs of the serious home cook. The Stages sink comes with a full array of integrated accessories to simplify the cooking and cleanup processes. The design offers a wide basin to accommodate large pots and pans, as well as a stepped side platform for prepping food or drying dishes. Handcrafted from premium quality, 16-gauge stainless steel, Stages features an engineered sound-absorption system that significantly reduces disposal and dishwashing noise. 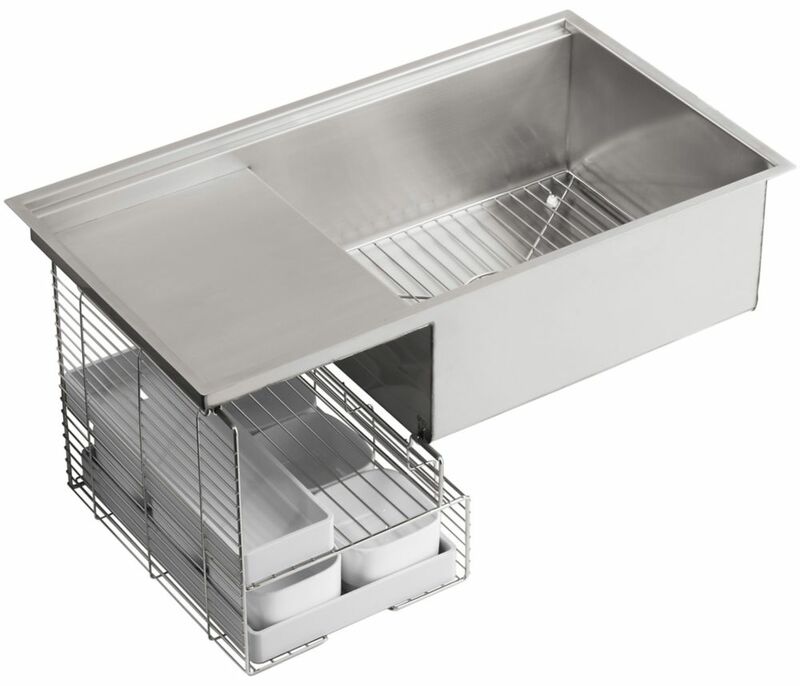 Stages Undercounter Stainless Steel 33X18.5X9.8125 0-Hole Single Bowl Kitchen Sink is rated 4.0 out of 5 by 4. Rated 1 out of 5 by Helene from I have a hole!!! The weld where the raised flat surface meets the sink wall on the turn down must have been missed as it is non existent. Apparently they don't water test these sinks. Needless to say I am devastated now that my counter is installed and Kohler has no way to repair it on site, only replace it. I have had my counter in for one month and I hate to have to take this sink out and replace it. I could cry. While I like everything about the sink other than the welded seams as it is not as sanitary as a punched sink with rounded creases. This issue should be a warning for anyone considering this sink. Sorry I have to say this Kohler. Rated 5 out of 5 by Kitchy from Who knew you could lust over a sink I have a modern theme and this sink fits in beautifully. The finish is nice, I absolutely love the attachments like the cutting board which I refuse to use since it's so nice looking and custom fit to the sink. More importantly after discount price hunting, I was happy. The cost was manageable considering the sink's cost could easily be a big part of your kitchen reno budget which is absurd! Also, the elevated dish drain does give you less work space but it's still a big enough space and that feature really does come in handy. Rated 5 out of 5 by Bobby from Beautiful product, outstanding service I was very surprised when my sink showed up 3 days after it was ordered. The sink is beautiful and comes with all kinds of nifty accessories including a cutting board that is too beautiful to use. Rated 5 out of 5 by Want2BChef from The Most Efficient Kitchen Product You Will Ever Purchase Efficient, Practical, Beautiful, Extremely Functional in Small Areas. This is a Top-of-the-Line product every kitchen should have--the Cutting Board is Exquisite and Heavy and other Accessory pieces are High Quality. Pair this with the Koehler single hole faucet with the handle in front of the faucet (also at Home Depot or Fixture Universe) and any tiny kitchen becomes a chef's dream.